Christmas Cheer Girls Christmas Gymnatics LeotardGymnastics Leotard - Free Scrunchie! Click the button below to add the HOLIDAY MAGIC! Red and White Mystique Girls Gymnastics Leotard with Rhinestones - FREE SHIPPING and Free Scrunchie! to your wish list. Introducing the Holiday Magic girls' gymnastics leotard. This dazzling gymnastics leotard is guaranteed to turn heads at the gym and on the podium. 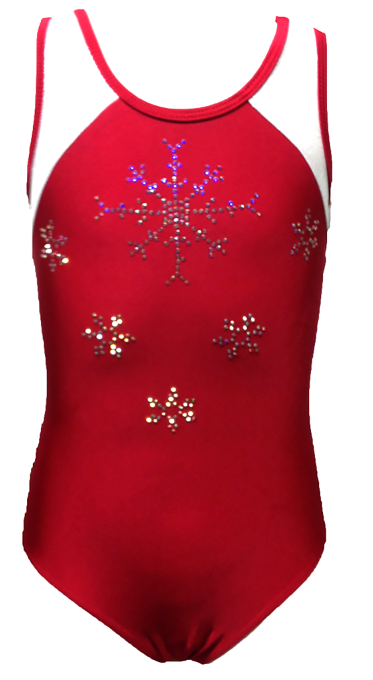 The brilliant rhinestone snowflake design set against a radiant red backdrop give this one-of-a-kind gymnastics leotard gives it that unique, eye-catching sparkle. This lightweight, statement-making leotard is designed to provide the ultimate in comfort and durability. Every genuine Holiday Magic girls gymnastics leotard is hand-sewn in the USA from the finest nylon spandex 4-way stretch material featuring rich craftsmanship and precision detailing. The eye-popping design of this brilliant leotard will give every champion gymnast an unbeatable combination of confidence, comfort and style. Not only is this leotard an absolute show stopper, its elegant and shimmering design make it the perfect holiday gift. Add some magic to your workouts. Order your Red Winter leotard today!